I did this walk on the 27th August 2006. After driving down from London I parked in a the small car park besides Dover Station, photo 1, which is free on Saturdays and Sundays and took the train over to Sandwich station where I had finished the last stage of my walk along the Saxon Shore Way. A single ticket cost £4.10 and the journey took just over 20 minutes. From Sandwich station, photo 2, it is a very short walk back to the route of the Saxon Shore Way as it continues its way around the town, photo 3, along the old town walls back towards the Stour at Sandwich Haven. From Sandwich Haven, photo 4, the path turns right along the Great Stour for a short distance before crossing Vigo Spring which is then followed on a paved path towards the Royal St Georges Golf course. The path crosses another small bridge over the North Stream and enters the grounds of the golf club where it winds its way between the fairways toward the coast. To the left the cooling towers of the old Richborough Power station are still visible on the horizon. The route of the path was well marked as it made its way across the course, photo 5, and there was only one fairway that needed to be crossed where I had a short wait as a group of golfers finished their tee shots. The sign in the photo reads "To the Sea" and "Beware of golfers approaching from the left". Eventually the path makes it way over the course to Princes Drive and the English Channel. To the left, photo 6, there were views over Pegwell Bay towards Ramsgate. To the right the shingle beach, photo 7, stretched away towards Deal. The path initially ran along the road at the top of the shingle beach, past the houses of the Sandwich Bay Estate where the road becomes a track. Further on the path leaves the track and drops down to runs alongside the fairways of the Royal Cinque Ports Golf Club. While this was softer walking than along the track above the beach which had become quite stony it also meant that there were no views either. It was a bit of a plod to Deal through a fairly featureless landscape and one of the few interesting things had been watching the different colours of the sea and the ever changing cloud cover over the channel. 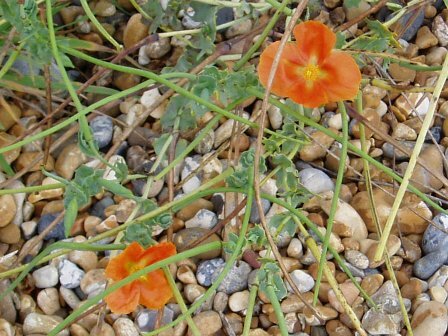 There were a few interesting plants growing amongst the shingle, including the flowers in photo 8, although I have been unable to identify what they are. Photo 9 was taken looking back up the coast from the end of the seafront in Deal. Reaching Deal the path follows the coastal promenade through the town, passing the pier, photo 10, with its rather odd sculpture, photo 11, in front of it. Deal has a small fisihing fleet and a number of boats were drawn up on the steep shingle beach, photo 12. The path continues along the seafront past Deal Castle, photo 13, and on towards the memorial bandstand where a concert was being eagerly awaited by a large number of spectators, photo 14. The bandstand was opened in 1993 as a memorial to the 11 Royal Marine bandsmen killed by an IRA bomb at the Deal barracks a few years earlier in 1989. Leaving the bandstand the Saxon Shore Way path continues along the tarmac path that runs along the top of the beach towards Walmer. As I had been passing through Deal the winds direction changed considerably in a short space of time and began blowing up the coast, directly in my face. Just passed Deal I stopped to eat my lunch at a bench overlooking the sea and to my left the sky was a mass of dark grey clouds, to the right a fairly clear blue sky, photo 15. Fortunately the darkest clouds always remained behind me and although I could spot a few rain showers in the distance I managed to stay dry the whole day. The path passes Walmer Castle, photo 16, official residence of the Lord Warden of the Cinque ports, and then continues on past the houses of Kingsdown before turning briefly inland to join a road that runs down to Oldstairs Bay, photo 17. This marks the start of the white cliffs of Dover which begin to rise and at the end of the bay. The path climbs up a flight of steps to reach the cliff top and heads towards Hope Point. Photo 18 was taken looking back down over Oldstairs Bay towards Deal. The path continues to climb steadily from Hope Point besides farmland, photo 19, towards Bockell Hill where it passes a memorial, photo 20, to the Dover Patrol. It consists of an obelisk of granite 83ft. 9ins high and was unveiled by H.R.H the Duke of Windsor (then Prince of Wales) on 27th July 1921. Passing the memorial the route of the Saxon Shore Way begins its descent down into St Margarets Bay, photo 21, the last part of which is down a steep set of concrete steps which leads down to the car park besides the bay. Just past the memorial my mobile phone picked up a French transmitter and I got a text message informing me that "it costs only 40p per min to call home from France". I know I was fairly close to France across the channel but not quite that close!! I stopped for a short rest on the sea wall in St Margarets before continuing along the path which climbs steeply out of the bay, at first along the road and then along a track besides the Pines Garden to regain the footpath along the top of the cliffs. Photo 22 was taken looking back over St Margarets Bay once I had reached the top. 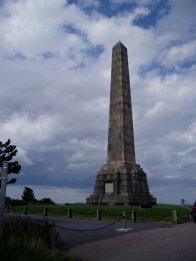 The Dover Patrol memorial that I had past earlier can just be made our on the horizon. I was getting quite close to Dover now and there was a constant stream of ferries arriving and departing from the port, photo 23, as well as a lot of other shipping traffic that could be made out heading up and down the centre of the channel. The path continues to rise, heading inland slightly before skirting the lighthouse at South Foreland, photo 24. The Saxon Shore Way continues on to skirt round Bantam Hole, photo 25. Looking back there were good views of the white cliffs by Fan Point, photo 26, the chalk face lit up by the afternoon sun. In the distance Dover Docks grew ever larger, photo 27. The whole section of path between Oldstairs Bay and Dover had been very busy and it made a pleasant change to see so many people out enjoying themselves in the countryside, so often when I am out I hardly see anyone out walking. The path then makes its way round the folds of Langdon Hole, photo 28 then passes by the National Trust visitor centre at Fox Hill Down, photo 29. Dover Castle can be seen on the hill in the distance although it was impossible to get a decent photo due to the angle of the sun. By this time I was beginning to feel quite tired and the soles of my feet in particular had started to hurt. They had been feeling a bit sore since my walk along the South West Coast Path the week before and much of this walk in the early stages between Sandwich and Oldstairs bay had been on tarmac paths which always make my feet feel tired, particularly when wearing my Zamberlan walking boots which do not have much give in the sole. With hindsight it would have probably been better to wear my lightweight walking shoes but I had been expecting wetter weather and they are not waterproof. So rather slower than normal I began my descent down from the top of the cliffs into Dover itself. A flight of steps takes the path under the A20 and down into the town below Dover Castle. The path heads along Atholl Terrace to cross Marine Parade and then makes it was along the seafront of Dover Harbour, photo 30. While I was walking along the seafront in Dover I spotted a small inflatable boat with someone inside it and another person in the water attempting to swim with the boat to the shore although the swell of the tide was making this difficult. They were clearly in difficulties and a harbour patrol vessel turned up and manoeuvred itself to try and throw a line to the boat although their first attempt missed. Meanwhile on the shore a policeman succeeded in throwing a line out to the inflatable boat which with the help of some passers by was gradually pulled in to a flight of steps that led down to the harbour, photo 31. As this was happening a lifeboat also turned up on the scene to join the harbour patrol vessel, photo 32. After only a few minutes first the man and then a couple of minutes later the girl, who had been in the inflatable boat left their rescuers and disappeared off along the sea front leaving the boat behind, refusing all offers of towels or assistance which seemed a bit strange to me. Just across the road from the seafront was a statue entitled "The waiting Miner", photo 33. This statue sculpted by H Phillips was commissioned by the C.E.G.B. and sited at Richborough Power Station in 1966. It was relocated to the Marine Parade, Dover following the closure of Richborough Power Station in September 1997. Not only did it act as a reminder of the power station I had spent so much time looking at on the previous stage of the Saxon Shore Way but also of the Kent coalfields which used to be in the area but now no longer exist. From the seafront the path makes its way along New Bridge, goes under the Town Hall Road and passes through Bench Street and into Queen Street where it joins the route of the North Downs Way. The route then crosses York Street and heads up Adrian Street to a flight to of steps which lead up to the edge of the western Heights. At the top of the steps the path continues further uphill to the Drop Redoubt fort, photo 34. This was built into the top of the hill between 1804 and 1808 at the time of the Napoleonic Wars. The path follows the edge of the fort round to the North Military Road where I ended this stage of my walk along the Saxon Shore Way. From the top of the hill by the Drop Redoubt fort there were good views across Dover towards the castle upon the opposite hill, photo 35, and further round there was also a good view down towards Dover Priory station where I had parked my car, photo 36. I rather regretted having climbed up to the fort from Adrian Street as not only did I have a very steep half mile walk down to the station I will also have to do the equivalent walk back up again next time I am here to rejoin the path, still it keeps me fit. The GPS made this walk 16.8 miles. 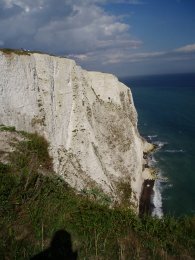 It was a very varied and enjoyable days walking taking in the flat coastland and shingle beaches between Sandwich and Deal and then the high cliffs into Dover although the soles of my feet felt very bruised at the end, enough to stop me going out walking the following weekend. Having just looked on the internet to check I had spelt Zamberlan properly I came by complete chance across a site, OutdoorMagic.com, which had five reviews on the boots I have. These were all very favourable apart from the following comments "replaced footbeds laces o.k the rest just top quality" and "These boots are let down by a cheep footbed - which I replaced;and laces which keep comming undone. Replace the naff laces and footbeds and you will have yourself a fantastic pair of boots". which just confirms what I had already figured out myself. I have not had a problem with the laces, a tight double knot does fine, but I do need a more forgiving footbed. Now I just need to pluck up the courage to change it myself.